Director – Richard Compton, Screenplay – Donald S. Sanford, Based on the Novel Path to Savagery by Robert Edmond Alter, Producer – John Hyde, Photography – Vincent Saizis, Music – Fred Karlin, Special Effects – Fred Cramer, Makeup – Dottie Pearl & Bob Westmoreland, Production Design – Ronald E. Hobbs. Production Company – Cinecorp. It is after the holocaust where the oceans have become poisoned and the Earth is barren and nothing will grow anymore. With death and famine everywhere, the survivors are picked off by gangs of murderous Ravagers. The middle-aged Falk lives in the ruins of a factory with his lover Miriam. However, she is then killed by a gang of Ravagers. Falk takes revenge, killing several of the Ravagers in return. With nothing left to stay for, Falk sets out across the countryside. Along the way, he falls in with the aging ex-soldier Kramer and a girl Faina. Faina talks of the mythical place of Genesis where things have started to grow anew. Falk sets out to search for Genesis and discovers a community set up on an island housed in two abandoned freighters where people have made remarkable progress in starting to rebuild. At the same time, the gang of Ravagers come after Falk, seeking revenge. Although it has been almost completely forgotten today, Ravagers is an interesting venture into the post-holocaust milieu. If nothing else it is a refreshing change from the cliches of vehicle chases and anarchic crazies in leather and mohawks that became the standard post-holocaust scenario following Mad Max 2 (1981) a couple of years later. By contrast, Ravagers has a downbeat look and quasi-mystical eco-theme, even if it is only echoing the likes of Glen and Randa (1971) and especially George Stewart’s novel Earth Abides (1949). There is much more of an emphasis on ordinary people trying to survive and rebuild amidst the remnants of civilisation, which certainly make for a different treatment of themes. On the minus side, director Richard Compton appears distant from his actors – the initial scenes between Richard Harris and Alana Hamilton lack much conviction. In the lead, the celebrated Irish-born stage actor Richard Harris delivers one of his silliest performances, giving the impression that he is making most of it up right on the spot. On the redeeming side, Art Carney provides some amusing comic relief in his appearances as a sergeant looking for a captain to serve. The main problem with Ravagers is its vagueness. 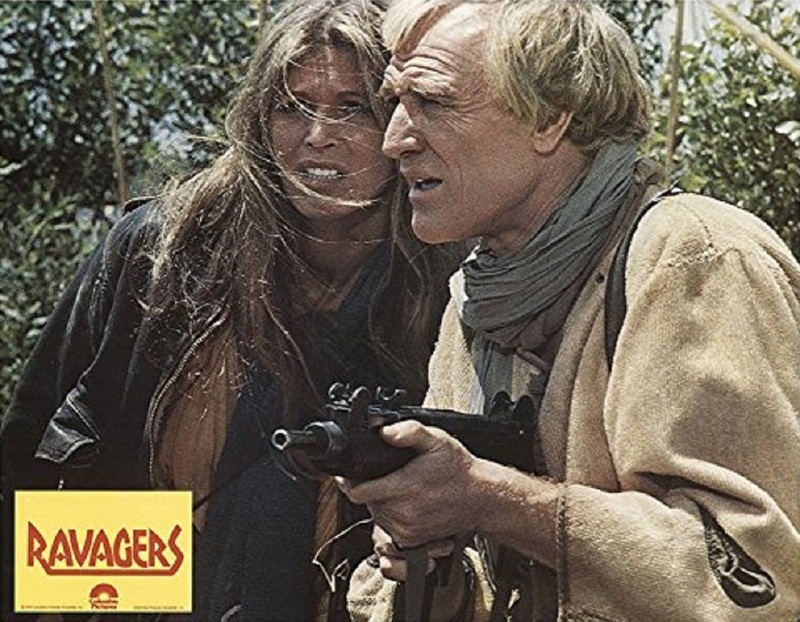 The plot seems rather shapeless – both Art Carney and Ann Turkel (who was Richard Harris’s wife at the time) just decide to start following Richard Harris on his quest across the countryside without any clear reason; the gang of Ravagers keep following Harris with an obsessive regard and somehow turn into expert trackers able to follow his trail no matter what. Despite director Richard Compton coming from an action movie/exploitation background, action is one element that is almost completely absent from the film. The whole film takes place at a lethargic pace. You almost wish that Ravagers had come along a couple of years later after Mad Max 2, where the prevailing model of the genre would have dictated that the action department have been spiced up somewhat. Certainly, you can see that a reasonable budget was thrown at Ravagers. Despite which it ended up being a financial flop that was not widely seen when it initially came out and has never reappeared on video/dvd subsequently. Director Richard Compton had previously been known for drive-in classics like Macon County Line (1974) and Return to Macon County (1975). Subsequent to Ravagers, Compton became a tv director, although did later return to the science-fiction genre as a producer on tv series like Babylon 5 (1993-8) and Sliders (1995-2001).